Physio Ian Stanley has devised a programme of daily exercises to help prevent injury and to help our ageing bodies cope with the demands of continuing to play hockey into our sixties and seventies. Start doing these exercises now and you will reap the rewards! Traning sessions for Over 60 and Over 70 squads will now be restricted to members of the selected international squads, though the February date for the Over 65 squad had to be changed. The Over 70 training squad will include all those who have made themselves available for selection. Scottish Thistles will make separate arrangements for training. 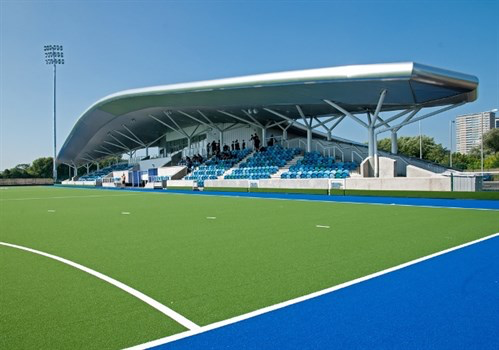 The first Over 65 training session was on Sunday 17 February at Glasgow National Hockey Centre and they will take part with Scottish Thistles teams in a mini-tournament on Sunday 31 March at Glasgow Green (12:00-15:00). Over 60 (10:00-12:00 and 13:00-15:00) and Over 70 (12:00-14:00) international training sessions took place on Sunday 24 February and the next sessions were at the same time on Sunday 31 March at the High School of Glasgow. There was a club training session on Sunday 17 February at Glasgow National Hockey Centre for all other club members. A team made up of players who are not involved in the Scotland Over 60 or Over 70 training sessions on Sunday 24 February gave the Scotland Over 70 side some match practice ahead of their International against England on 5 March. The fourth training/selection event of 2019 for the 'Thistles' International teams took place on Sunday 31st March at Glasgow Green, from 12:00-15:00. The format was a three team round robin mini-tournament including the Scotland Over 65 squad. The Over 65 squad will train at Glasgow Green on Sunday 12 May (13:00-16:00) and Sunday 9 Jun (12:00-14:00). The session planned for Sunday 21 April has been cancelled due to lack of numbers on Easter Sunday. The Over 60 squad will train on 12 May (High School of Glasgow 10:00-15:00) and 9 June (Peffermill 10:00-15:00). Training for the Over 70 squad will be on Sunday 14 April at the High School of Glasgow (12:00-14:00) and on Sunday 12 May at Peffermill (13:00-16:00). Gordon Mackenzie organised a very successful intra-club tournament at Peffermill, Edinburgh on Sunday 16 December 2018. All players aged 58 and above, including non-members, were invited to turn up on the day with blue and white strips and ten pounds match fee. Teams were picked on the day. The Scottish Thistles Sub Committee intends to organise another tournament on Sunday 1 September 2019, and to make this a regular, twice-annual fixture.